Engaging name? Check. Eclectic design? Check. Busy neighbourhood? Check. 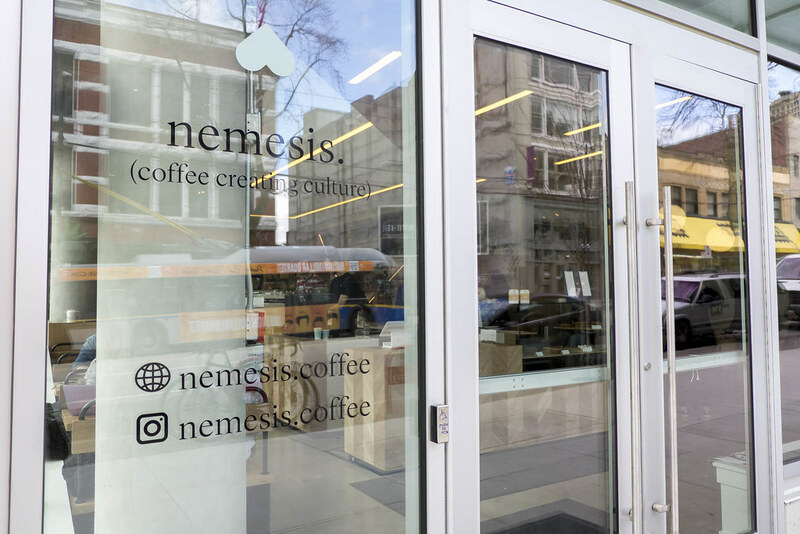 All the things that help make a new coffee shop busy are in place, and it looks like Nemesis Coffee has been unravelling from its soft opening to a full-on opening. Do the coffee and atmosphere make for a terrific experience or are the prices too high to justify? Read on to find out. The Latte was beautiful. Its leaf pattern was pretty good and the ring of dark brown added a pleasant texture to the foam. This tasted great too with a good blend of espresso that merged into a creamy foamed milk. It being served in a glass cup also added to its aesthetic appeal. The Hazelnut Financier was my choice of baked good. The bar had good heft, was moist on the inside, and had a satisfying crunch on the outside. The Farm Meat Waffle was my entree, and this is where I think Nemesis Coffee differentiates from the other high-end coffee options (e.g. Timbertrain, Revolver). This was a farm meat waffle topped with a poached egg, pickled onions, and country gravy. The poached egg was perfect and the pickled onions added a sour zing. I didn’t find the waffle to be too amazing as it had an average amount of fluffiness among waffles I’ve had (e.g. Miura, Waffle Frenzy). The farm meat was quite tasty so meat lovers, often left out of cafe menus, can have their carnivorous needs satisfied. 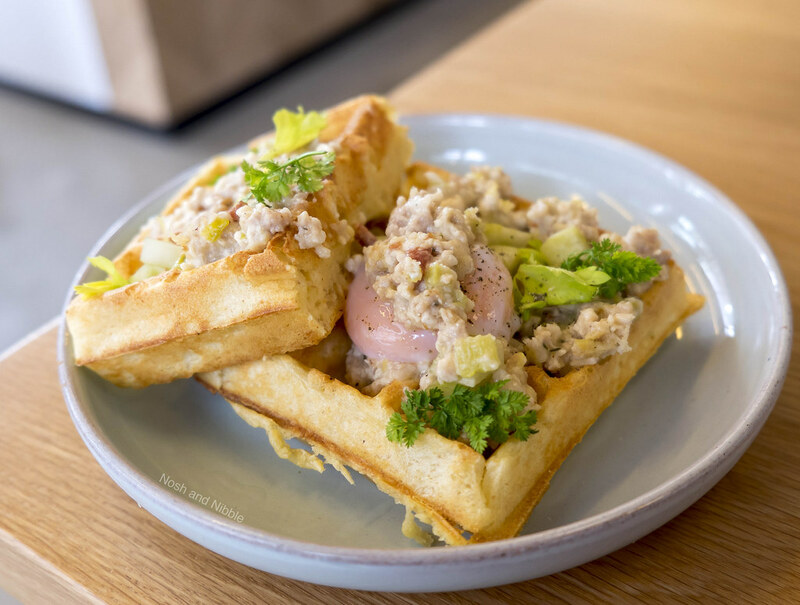 The $14 price tag launches the Farm Meat Waffle into the higher echelons of cafe dining. I’m not sure if the cafe’s lease is super expensive or how much creative effort was behind the food menu, but this is above the average Gastown lunch cafe price. Catch-122 Cafe Bistro serves filling brunch plates for $13 and La Tacqueria offers 4 tacos for $10.50. Both options are cheaper, arguably more filling, and are <150 metres. I’m not saying the waffles aren’t good dishes, but this cafe’s food menu is clearly aimed at a finer cafe audience, and everyday lunchers are probably going to be put off. Nemesis Coffee is a beautiful space with an coffee bar in the middle of the room. There are cute booths, a long table, standard tables, and counter seating in what looks like a capacity of 40. The space is brand new, features hanging gardens, and its light woods made my experience feel refreshing. 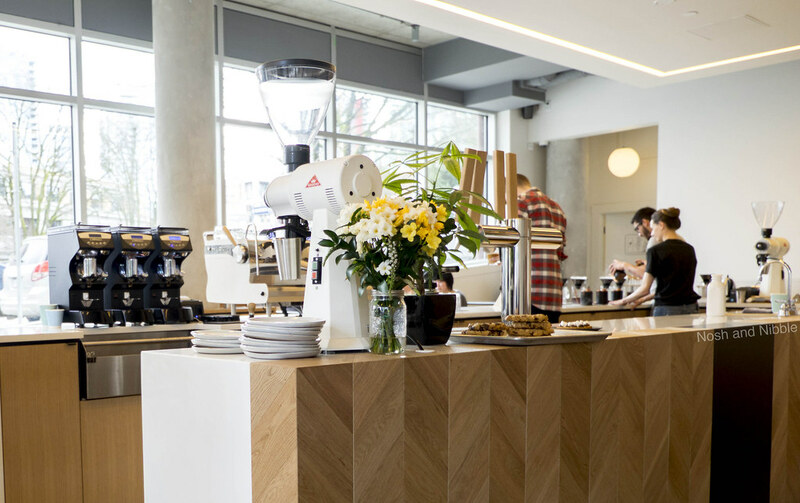 I enjoyed admiring the diagonal patterning of the coffee bar and all the espresso equipment. Service was less than thrilling. It looks like Vancouver Barista had a great time with the staff who attempted to spur musical discussion but the staff who took my order at the front didn’t seem to go out of their way to get my name or find out how much I knew about Janelle Monae (order numbers are translated to music artists here). 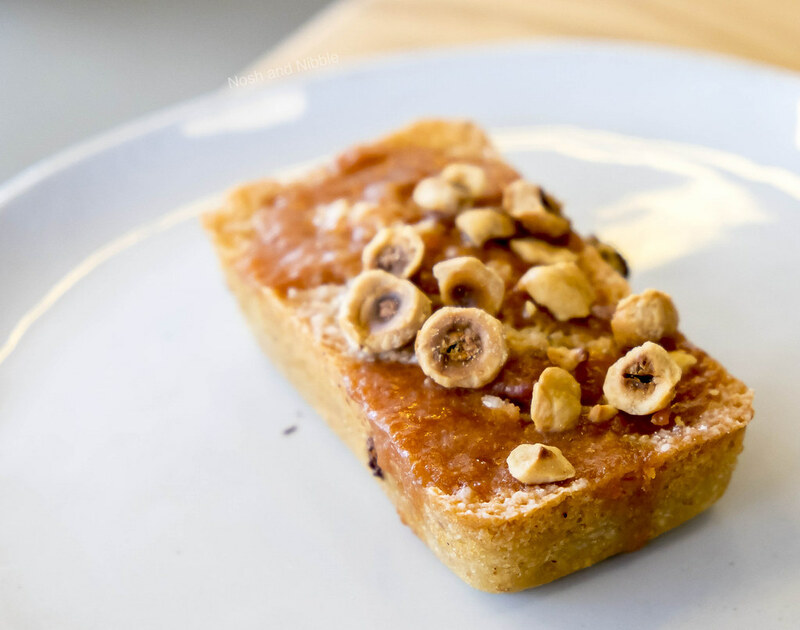 In addition, the cashier forgot to give me my hazelnut financier, and I was sitting at our table wondering if the financier was going to come out from the front counter or if it was coming from the kitchen. I ended up waiting in line again to get my financier. My friend I was dining with ordered a pour over but we were not given instructions to wait by the pour over bar to pick up our own coffee (my latte was delivered to the edge of the coffee bar. 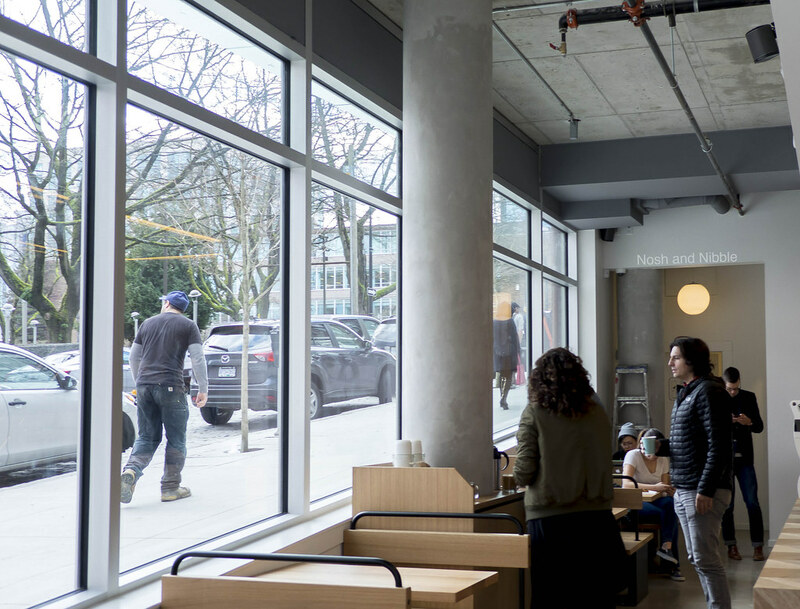 By the time my friend decided to get up (we were sitting on the far end of the restaurant touching the next building) and ask about his pour over, his pour over had been sitting on the counter with no discernible attempt by the staff to deliver it into its purchaser’s hands. It seems the musical artist number sytem is only related to the food you order, so it might be best to wait by the espresso bar to pick up your drink before finding a seat. I feel there’s a better solution. 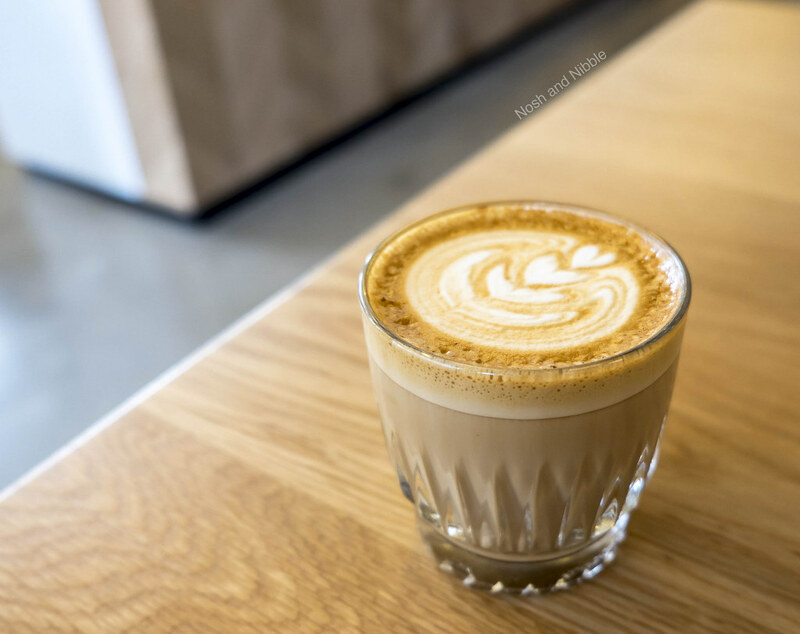 The solution might be to just grab a coffee and baked good to go, and avoid the lacklustre service we received on this particular Friday or paying a higher than average food price. Would I go back? Not for the kitchen food.